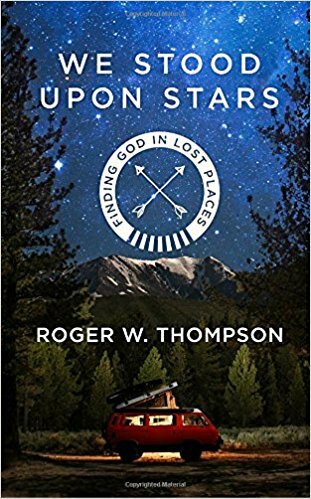 We Stood Upon Stars by Roger W. Thompson attracted me because of its cover of a VW van and a star-covered night sky. The advertisement of 32 maps was a bonus. I had never heard of the author, but an outdoor-themed devotional was attractive to this backpacker. The book is a memoir of collected memories separated into quick chapters with a hand-drawn map of the areas the book describes in that particular chapter. It is a book that expresses worship in God, adventures in dating, marriage and fatherhood with humor, deep conviction, and a beautiful narrative. Threaded throughout the book are references of his grandfather and their motorcycle adventures. The book is a meditation of relaxation in the middle of a busy day, to get lost in the book’s narrative and dream of adventures yet to come. Loss is especially poignant in the book. My eyes suspiciously watered a few times in which I blinked and tried to push down the knot in my throat. Some chapters hit too close to home like the loss of their dog and when the author said goodbye to his grandfather. The only drawback to the book was the lack of Scripture references. If there were any, I didn’t catch them. The maps are wonderful for decoration, travel tips, and reminiscing; or perhaps pieces of art that one could blow up into a print and frame. My husband read the book first. He sped through the pages like a child eating his first cake. “Easy reading,” He mentioned to me. When I reached parts of the book that made me laugh, he would turn to look at me and ask me what part I was reading. The book was memorable to him. While not marketed to men (that I saw anyway), the book is ideal for men’s groups or young men. The wisdom in its pages are timeless. Whole families are difficult to find and young men need good mentors. Any young man might enjoy this book purely for the inspiration to get up from the couch and go somewhere. *book given by the publisher to review.